Our outdoor enclosures are NEMA 4 rated. NEMA 4 enclosures are constructed of powder coated steel to provide protection in outdoor environments. They protect your fiber optic connections against dirt, dust, and water (rain, sleet, snow, splashing water, and hose directed water). 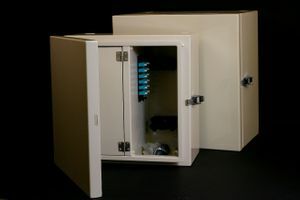 The exterior door seals with a gasket and pass-thru glands are provided for the cable entrances.The interior network compartment has one locking door. Each enclosure accepts LGX adapter panels (sold separately) which allow selection of a variety of connector styles. LGX adapter panels are 5.3" by 1.2" with two push latches (spaced 4.65" apart). Other sizes and capacities are available.